Compendium summarizing independent, peer-reviewed and published research. 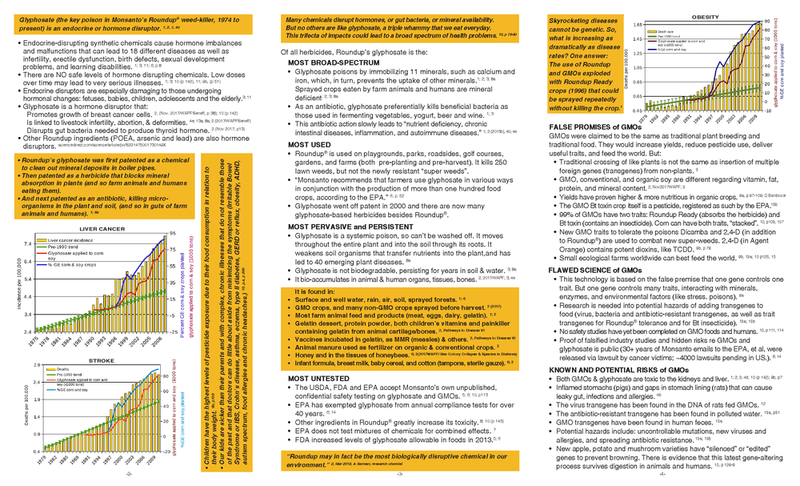 Pamphlet format (8x14) to download – and share! Sources used in this compilation by L. Johnson (6/2018), skyhillfarm.ny@gmail.com. 1. 17 Reasons to Ban Glyphosate by Nancy L. Swanson, 2013. 2. Six studies entitled Pathways to Disease I through VI by S. Seneff & A. Samsel; also lectures and slide presentations by S. Seneff, https://people.csail.mit.edu/seneff. 6. U.S. Right to Know (USRTK.org); also, Whitewash. The Story of a Weed Killer, Cancer, and the Corruption of Science, by T. Gillam, 2017. 7. (a) Poison Foods of North America, by A. Mitra, 2017; (b) Poison Spring, E. Vallianatos w/ M. Jenkins, 2014. 9. (a) Myths of Safe Pesticides, by A. Leu, 2014, pp. 62-85; (b) Poisoning Our Children, by A. Leu, 2018. 11. http://www.endocrinedisruption.org; A Case for Revisiting the Safety of Pesticides, T. Colborn. 12. CaMV 35S Promoter in GM Feed that Sickened Rats Transferred into Rat Blood, Liver, and Brain Cells, by M-W Ho, 2015. 13. (a) Ban GMOs Now: Health & Environmental Hazards, Especially in the Light of the New Genetics, by M-W Ho and E. Sirinathsinghji, 2013; (b) 10 Questions About GM Foods, by C. Robinson, M. Antoniou, and John Fagan, 2014. 15. GMO Myths and Truths, by C. Robinson, M. Antoniou and J. Fagan, 2016. Suggested ways to use the pamphlet. 1. Inform and update people about the correlations between diseases, glyphosate and GMOs. 2. Hand family, friends, and others several pamphlets and ask them to share copies. The high correlation (between diseases, glyphosate and GMOs) shown in the graphs is based on ten years of USA government data. Glyphosate can’t be washed off and accumulates in bodies of people, farm animals, pollinators, etc. Most Americans are eating this poison in every meal, everyday – in farm crops, animal products and packaged foods. Glyphosate disrupts hormones, gut bacteria, and mineral availability. The young are most impacted, and likely have been eating this slow poison for their entire childhood. Both glyphosate and GMOs are known to cause liver and kidney disease – the two organs that detoxify. Note that herbicides are poisons used outdoors. They directly affect soil, plants, water (runoff and ground water), and air quality, all in the public domain or Commons. Use the term poison. Herbicides kill. They are toxic. 4. Convert talk into action. Work toward a neighborhood goal of limiting or even banning the use of glyphosate. 5. Keep the action small and local. For example, focus on banning use on your block or apartment complex, hamlet or village, local park or golf course, local roadsides or highway segment. 6. Distribute pamphlets to local health and government officials, public and private educational institutions, libraries and hospitals, farmers and gardeners, etc. 7. Share on social media. Single graphs could be uploaded onto social media with links this website.